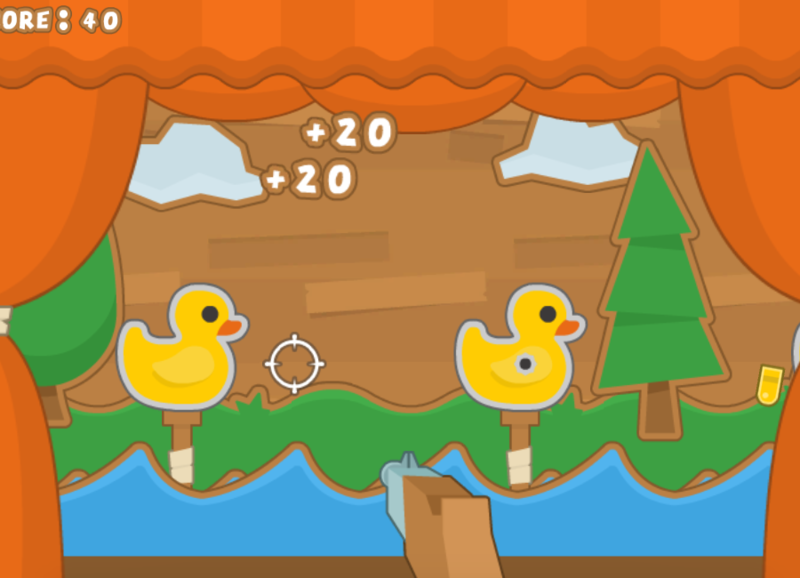 The duck hunting Shooting Gallery is a small game I created in Unity (2D) using C#. I used CC0 licenced assets from Kenney. I found the assets which were for a complete game, and I decided to make the game using these assets. The Shooting Gallery acts like one which you might see at a fair/carnival. If you shoot the duck, the whole duck spins around, and a bullet hole is left. The scenery moves in the background in a circular motion, which was achieved by making the x and y coordinates add cos(time) and sin(time) respectively. The game is relatively simple - you have 20 seconds to fire 12 bullets. Hitting a mallard duck will give 10 points, and hitting a rubber duck will give 20 points. There is no lose condition in this game. The game is available to try on Windows and Mac.